Mr. Woodruff, a manager at Western Union writes Miss Berry to discuss the delivery status of two telegrams she had sent to Seymour M. Stone. 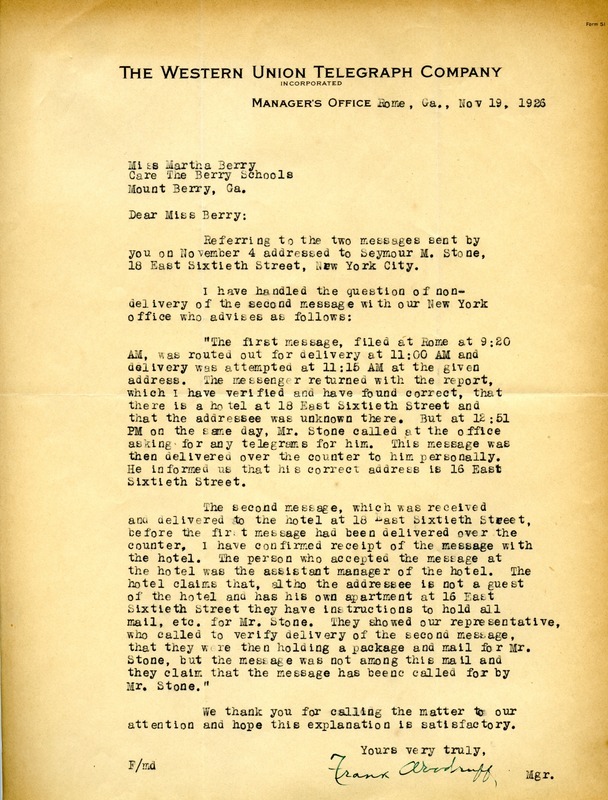 Seymour M. Stone, telegram, Western Union Telegraph Co.
Mr. Frank Woodruff, “Letter to Martha Berry from Frank Woodruff.” Martha Berry Digital Archive. Eds. Schlitz, Stephanie A., Chelsea Risley, Alan Henderson, et al. Mount Berry: Berry College, 2012. accessed April 21, 2019, https://mbda.berry.edu/items/show/3861.